مقصودی, مهران, نیری, هادی, امانی, خبات. (1397). هیدرودینامیک و پایداری رودخانه قشلاق و تأثیر آن در توسعه شهری سنندج. پژوهشهای ژئومورفولوژی کمّی, 5(2), 66-81. مهران مقصودی; هادی نیری; خبات امانی. "هیدرودینامیک و پایداری رودخانه قشلاق و تأثیر آن در توسعه شهری سنندج". پژوهشهای ژئومورفولوژی کمّی, 5, 2, 1397, 66-81. مقصودی, مهران, نیری, هادی, امانی, خبات. (1397). 'هیدرودینامیک و پایداری رودخانه قشلاق و تأثیر آن در توسعه شهری سنندج', پژوهشهای ژئومورفولوژی کمّی, 5(2), pp. 66-81. مقصودی, مهران, نیری, هادی, امانی, خبات. هیدرودینامیک و پایداری رودخانه قشلاق و تأثیر آن در توسعه شهری سنندج. پژوهشهای ژئومورفولوژی کمّی, 1397; 5(2): 66-81. رودخانه­ها سیستمی پویا بوده و همواره برای رسیدن به تعادل بستر در مسیر خود برداشت، حمل و رسوب‌گذاری می‌کنند. به همین دلیل مشخصه­های مورفولوژیکی آن‌ها به‌طور پیوسته در طول زمان تغییر می­کند. پژوهش حاضر باهدف بررسی تغییرات مورفولوژی رودخانه قشلاق، شامل الگوی رود، روند تغییرات و جابجایی مسیر جریان آب، شناخت نظری فرایندهای رودخانه با در نظر گرفتن متغیرهای محیط طبیعی و همچنین تشخیص و پیش­بینی مسیرهای بحرانی ازنظر فرسایش کناری رودخانه انجام‌شده است. محدوده­ی موردمطالعه یک بازه 55 کیلومتری است که از دیوار سد وحدت (قشلاق) در 12 کیلومتری شمال شرق شهر سنندج شروع‌شده و تا سد در دست احداث ژاوه ادامه می­یابد. تکنیک اصلی کار مقایسه زمانی و مکانی تغییرات بستر رودخانه است. جهت انجام پژوهش حاضر از ابزارهایی مانند نقشه­های توپوگرافی 1:25000، نقشه زمین‌شناسی 1:100000، تصاویر ماهواره­ای لندست مربوط به تابستان سال 1364 و 1393 و همچنین مطالعات کتابخانه­ای استفاده‌شده است. 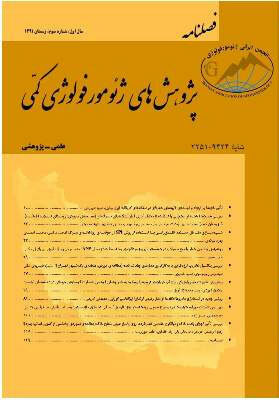 کنترل تغییرات از طریق کار میدانی صورت گرفته و در نرم‌افزار Arc GIS نقشه­ها و تصاویر رقومی شده، زمین مرجع گردیده و پارامترهای هندسی رودخانه با روش برازش دایره­های مماس بر قوس رودخانه در محیط نرم‌افزاری Auto Cad انجام‌شده است. سپس تحلیل­های کمی با استفاده از روابط ریاضی به‌دست‌آمده است. نتایج حاصل مؤید آن است که از ابتدای محدوده موردبررسی تا حوالی روستای سواریان تغییرات به دلیل جنس سست سازندها و تأثیرات بسیار زیاد عوامل انسانی، بسیار بالاست به‌گونه‌ای که می­تواند توسعه بدون برنامه شهری را با اختلال مواجه کند. اما در ادامه مسیر، در بازه زمانی موردمطالعه تغییرات کم­تری مشاهده می­شود. Sanandaj is located near the Gheshlagh River. Gheshlagh River, especially in the period studied flow deposition and low slope lands. Phenomena such as erosion and sedimentation and changes in river reactions that river to reach its steady.Hydrodynamics River Indicate how water flow in rivers, erosion and sediment deposition resulting in water flowing from one side and the other side, its role in the development of the geometric parameters. Factors affecting the dynamics of rivers act as cause and effect. Human impact on rivers without knowing anything about it, caused the channel erosion. In the study, the geometric parameters of the river in the period under review have been studied. To do this, maps and tools such as topographic maps of 1: 25,000 national mapping, the geological map of 1: 100,000 GIS, Landsat satellite images of the summers of 1364 and 1393 as well as documents and reports and books the library is used. The analysis of data available from the software Arc GIS, Auto Cad, Envi, Google Earth and others have been. This is applied research. Approach, analytical and comparative respectively. Methods In this Study, the first , air photo 1954, and images were georeferenced entered in the Arc GIS software. The river channel in the intervals were compared. To assess changes in the river was studied geometric coefficients. Comparing the geometric parameters of the river during the years of the study suggest that the pattern of the river and some geometrical parameters it has seen significant changes. The number of circles tangent to the meandering curves of the first period in 1364 was 16, while in 1393 it was 12 circle than tangent decreases. The most obvious signs of human activity in this period is the construction of Sanandaj airport on the river. In the second period, as the first interval, the number of departments with less time and the place has the river. Most of the material in the first and second is shale sediment, including the reasons for the changes in this range respectively. In the third period the number of meanders in 1364 from 25 in 1393 to 23 decreases. Most of the first wavelength range of 1098 to 1393 meters and the lowest is also related to the third interval in 1364. The average wavelength Gheshlagh meanders in the 64 to the 25.491 km, while the number for 1393 to 78.524 meters. River pattern tends to direct the first and second periods. But in the third period because of hard lithology and the impossibility of establishing human activity has seen little change. Changes in litter in the period of the study is several hundred meters. So should land be allocated to those who move within the context of this period they do not need to cost a lot over time.The results show that human factors in river Gheshlagh morphology changes effective. These factors, as well as hydrology, lithology and geological structure of the area to determine the behavior of the river. The importance of this study is among the first of its kind in the Gheshlagh river morphology and river engineering studies that examine changes in time is studied.